If you’re following me on Instagram or Twitter, you’ll know last weekend I had a little trip to Center Parks Elvedon for my 21st Birthday. I spent the weekend there with my family and had the best time. The last time I visited Center Parks was over 10 years ago, and before that, my family and I would spend a weekend there every Christmas. It’s a place very close to my heart and it was such a treat to be able to go back with all my loved ones. There were 8 of us in total, both of my brothers brought along a friend, my mum and dad, and Jamie and I. We stayed in a 4 bedroom lodge on the outskirts of the park and spent the weekend throwing ourselves down the rapids and flumes in the swimming pool, playing a bit of badminton and bowling and having a few drinks too! It was the perfect 21st present, being able to be a big kid and have a laugh with my family was brilliant. I would highly recommend looking into booking a trip yourself if you live near any of the parks. Jamie and I are already planning our next visit! On Saturday morning J and I had a little wander and shot this little outfit in the sunshine. I forgot how hard it is to shoot in broad daylight! I picked up this beauty of a skirt from ASOS in my haul I did a few weeks back. The pretty pink colour is just my fave and it’s so nice to find a skirt that fits over my bum but sits on my hips nicely!! 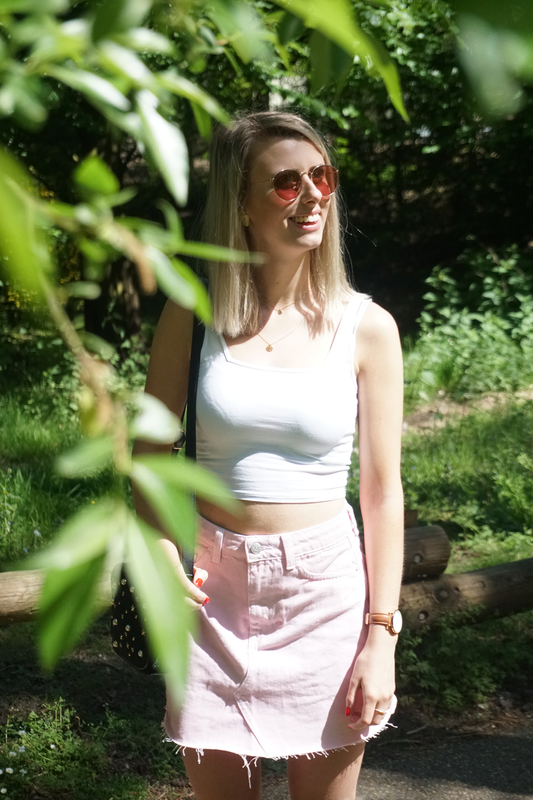 The square neck crop top is one of my summer basics, also from ASOS. I love the square neckline trend this Summer, and loved pairing it with some layered necklaces. As much as I love a basic top and skirt combo, I’ve promised myself to give dresses a go this summer and get some more variety in my wardrobe. Dresses are often far easier to style and far more comfortable to wear in this weather. I’ve also found myself with a lack of dresses that I can dress up for a sunny summer eve. I’ve already made a few purchases so keep an eye out to see them feature soon! This week I finally celebrated my actual birthday and I’m devastated that the celebrations are over! I had the loveliest day and was totally spoilt. You know you’ve got a keeper when your boyfriends present to you is a bloomin’ holiday to NYC!!! I’m so excited for our new adventure and for creating some super exciting content!